Welcome new friends! and hello long time friends! Thank you for all the nice comments on my last two furniture pieces. I haven't had a ton of time to visit those of you who stopped by and commented, but I hope to soon! I grew up as the daughter of an artist. There was always paint, canvases, light tables, artist markers, and creative things around. There are certain smells and sounds that are very nostalgic to me. When I was deciding on my college choices in the early '90's, I knew I wanted to be an artist too. I decided I would major in Fine Arts...although it was a little daunting. I loved painting, but Fine Arts sometimes felt kind of.... heavy. Fast forward 22 years later- as I sit on the cold cement floor of my garage, paint brush in hand, and a piece of furniture waiting for a new look, I know that this is the canvas I was meant to work on! ....I feel like an artist, in the medium I was supposed to use. I've always struggled with what to call my "job". I keep going back to Furniture Artist. Still needs a little tweaking, but it fits for now. I felt like yesterday was very productive- I got a work out in; and painted a buffet, small hutch, and this little table. It's such a funky little piece, isn't it? 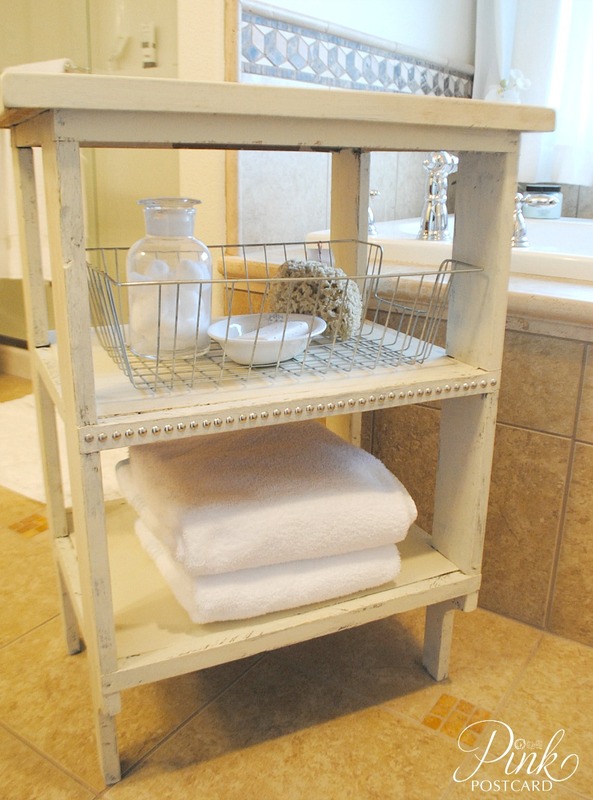 I love finding smaller furniture pieces that have character and usefulness, and when I found this one, both fit the bill! It had a strange color on it - even the sale tag listed it as "green side table"- although 'green' might be a stretch?? Loved the tray top and the unique legs. Yesterday as I was painting, I made a custom mix color in Annie Sloan's paint. I'm not sure it's too far off of Antique White, but it amounted to about 1/2 can of Antique White, 2 test pots of Country Grey, and 2 big globs of Pure White. 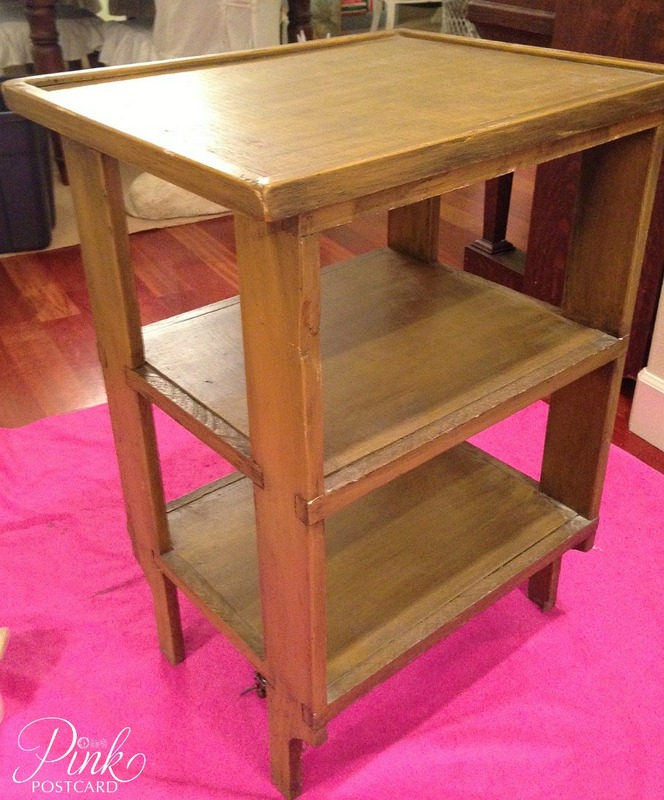 The hutch that I'm working on is being painted in this color, and I used the same for this table. It's kind of a creamy putty color. I stenciled the cross on top using a computer print out of the shape. Then, laying graphite paper under the paper stencil, I traced the image which left the imprint on the tray top. For the cross, I used an acrylic artist's paint, Liquitex, in their deep red. Once everything was dry, a little light sanding with my sanding sponge, all around the edges of the table as well as the red cross. Clear and dark wax- I like that the dark wax adds some extra character. I also added a little nailhead trim, just for added detail. Such a cute little utilitarian table! I wish it fit in our bathroom! It's such a versatile size, I'm sure you could use it in a variety of places around the house. Tomorrow I have another piece to show you- it's a bit different than the pieces I normally makeover....but it is also one of my all time favorites! Really like this piece. The red cross really makes it unique! 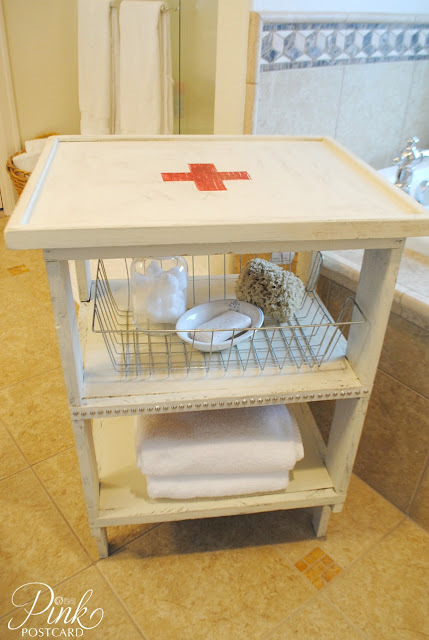 This is one cute little table...love the cross. That is adorable. I love the red cross on it. Such an adorable piece!!! You are so talented. So cute what a unique idea! Looks great! What a great idea. Gorgeous redo Denise, the red cross was a perfect choice!! 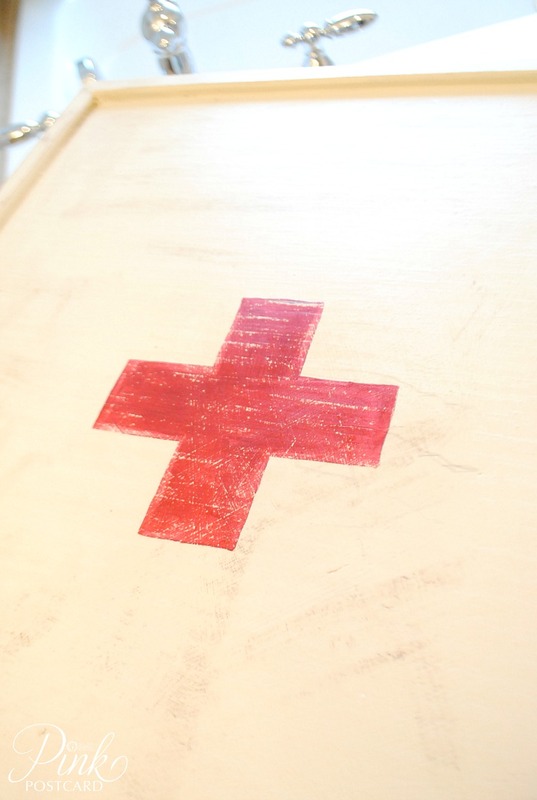 Very cute--I am working as red cross project--although it is a white cross on a red cabinet. That is darling - I love that makeover! It looks like it was meant to be just like that! Love it! Wow, it looks fantastic! I love the idea of the red cross on the top too.